Don’t miss a match with IPTV! Red Solutions bring Encoded Media’s IPTV solutions to the market allowing delivery of live and on-demand content to your screens and digital signage. Encoded Media offer a range of products from TV Servers, enabling TV to be delivered to a number of screens across your organisation, to IPTV Receivers which allow standalone screens to receive the channels over the network without a PC. 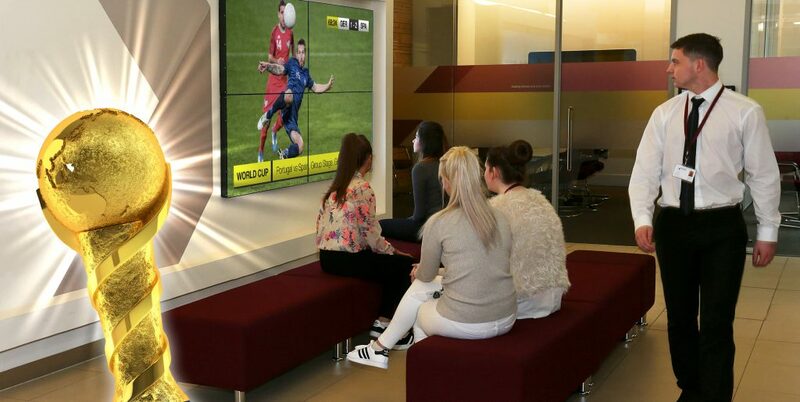 Stream TV via your network to screens, PCs and mobile devices or combine it with your ONELAN digital signage platform and stream the matches live into your digital signage display. Embracing large sporting events is a great way to increase staff and student morale and avoid unauthorised absences so take advantage of this and schedule those important matches. An afternoon match that we’ll be scheduling is England Vs Panama on 24th June at 13:00. When it’s all over you are all set for a summer of sporting events or you may decide to keep your staff up-to-date with world news. For more information on Encoded Media products click here. Alternatively, call us on +44 (0)1491 576 713 to talk about how we can help.